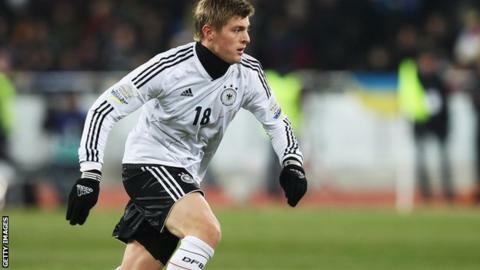 Bayern Munich midfielder Toni Kroos has indicated he would consider a move to the Premier League if he decides to leave the Bundesliga champions. The Germany international's contract expires in June 2015 and he has been heavily linked with Manchester United. "No decision has been made," said the 24-year-old. "It is no secret the Premier League is a possibility." But Bayern coach Pep Guardiola insisted he does not want Kroos to leave the European champions. In a news conference on Monday, Kroos insisted he had not made any decision about his future. "I've heard that people have written that I might go to England. But there's nothing new from my point of view," he said ahead of Tuesday's Champions League tie against Arsenal. "The situation is that I don't have any agreement right at the moment at Bayern. On the other side there is no agreement in place anywhere." Kroos has been an integral part of Guardiola's Bayern team which is 23 points clear at the top of the Bundesliga table and aiming to reach the Champions League quarter-finals by beating Arsenal. He has only missed two league games this season, while starting all seven of their European matches. "Toni's a great talent. I hope he maintains his form this season - and for more seasons at this club," said Guardiola. "He's young. He can improve. I've told him I can make him an even better player."